Introduction: Acute care surgery for peritonitis and perforated ulcer has traditionally been performed open, but in select circumstances may be safely performed laparoscopically with good outcomes. Methods: A retrospective chart review of emergent cases in an academic medical center involving acute abdomen from 2007 to 2008 included three perforated duodenal ulcers and one marginal ulcer following Roux-en-Y gastric bypass which were repaired laparoscopically. Patient records were reviewed for complications and follow-up was established through clinic records. Results: Four patients who presented with acute abdomen and imaging consistent with pneumoperitoneum were emergently explored laparoscopically and found to have perforated ulcers (three duodenal ulcers and one at a previous gastrojejunostomy for gastric bypass). The perforations were repaired with Graham patches and purulent contamination was irrigated laparoscopically. There were no operative complications. Patients were treated for Helicobacter pylori postoperatively and were discharged on regular diet and oral antibiotics. Mean hospitalization was 5 days. No complications were noted on follow-up. 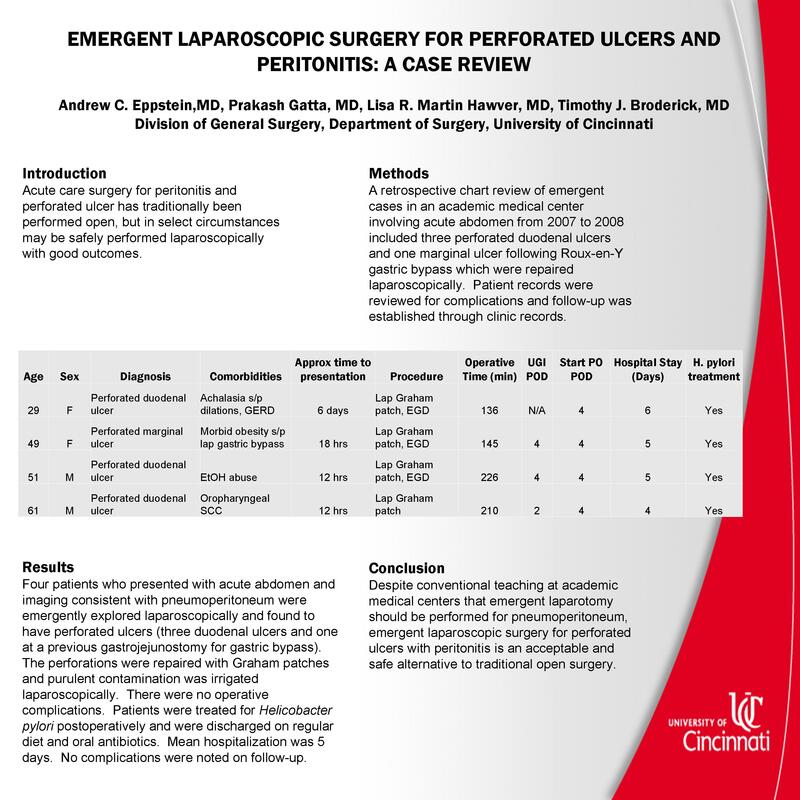 Conclusion: Despite conventional teaching at academic medical centers that emergent laparotomy should be performed for pneumoperitoneum, emergent laparoscopic surgery for perforated ulcers with peritonitis is an acceptable and safe alternative to traditional open surgery.